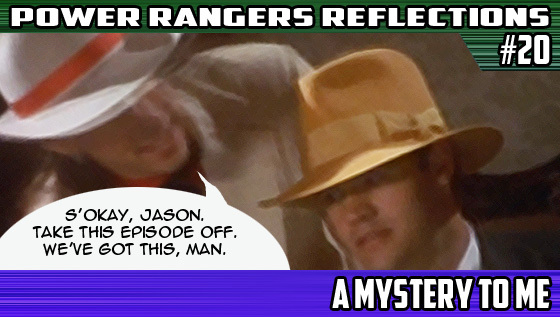 And so here we are; a new set of Power Rangers Reflections and with it, a new approach. So this is the new format; a basic plot summary and a couple points of observation. I'm fairly sure that somewhere down the line, we'll do the old-school format for certain episodes, but for the moment, this is what we're doing going forward. That way, I'll be able to manage entries more quickly and perhaps even more frequently. So today's subject matter is the Power Rangers Zeo episode known as "A Mystery To Me," where everyone participates in a "Who Done It" costume party. This also happens to be the two-hundredth overall episode of Power Rangers ever... and this is how they're celebrating that monumental occasion... with a costume party. The teens, apparently costumed as characters from the board game Clue, have been invited to Detective Stone's "Whodunnit" party so they can participate in a mystery. The mystery apparently involves the disappearance of Detective Stone thanks to the lights going out and him disappearing. So the teens look for clues and encounter a mysterious glowing door. Upon entering the door, they find themselves trapped in a cavern where they assume the suspects are kept. Unbeknownst to them, the glowing door was a trapped devised by machine princess Archerina in an effort to separate the Rangers from Kat, so she can take her on in one-on-on combat. Kat tries her best, but cannot defeat Archerina and her monster. Fortunately, Alpha finds the Rangers and teleports them back to the Power Chamber, where they morph and help Kat (and Auric, a tikiman of sorts) defeat the monster. As for the mystery, the culprit turned out to be Detective Stone... and that's it. So it's a mystery game and the focus of the episode was on Katherine, who was the target of Archerina, suggesting a mini-rivalry of sorts that lasted all of one episode. However, what I want to focus on is the abuse poor Rocky had to endure. Rocky plays the role of the butler and he gets accused by Tanya because it's always the bulter... turns out it wasn't the butler, but poor Rocky... wait, what was I talking about? So Jason is walking down the hallway and notices the strange door, but before he can get in, he is pulled away by BULK & SKULL, who quickly rush him to the room where all the witnesses are kept. As a result, Jason is prevented from suffering the same fate as his friends and is also completely oblivious to what's been going on throughout the episode. At no point does Alpha or anyone else ring in Jason to help out; he's just taking this episode off. Good for you, Jason. You deserve the break! 4. Who Owns The House? Apparently, the mansion featured in this episode would appear in a later season; Lightspeed Rescue's "The Fifth Crystal", where you had the rich grandmother. Don't know what episode I'm talking about? Click here for more. Honestly, I've got little to say about this episode. It was a pretty solid little episode that might not push the overall narrative forward, but was a fun little episode that was a change from the usual fare. Nothing too special, but on a whole, a fun episode. Well, maybe next episode will yield better results.